Large LCD for multi-parameter display on 70x52 mm screen. 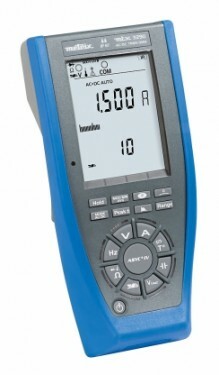 A simple basic multimeter with surveillance of the main functions: Min, Max, Avg and Peak+/- . Digital keyboard with lighting. Optimized ergonomics: IP67 leakproof casing, IEC61010 600V CAT III/300V CAT IV safety measurement terminals, power supply by normal battery or Ni-MH rechargeable battery (external charger) and contextual reminder of connections on screen. These portable multimeters with digital display allowing direct measurement of the main electrical quantities benefit from an innovative design making them compact, rugged, leakproof and comfortable to grip.